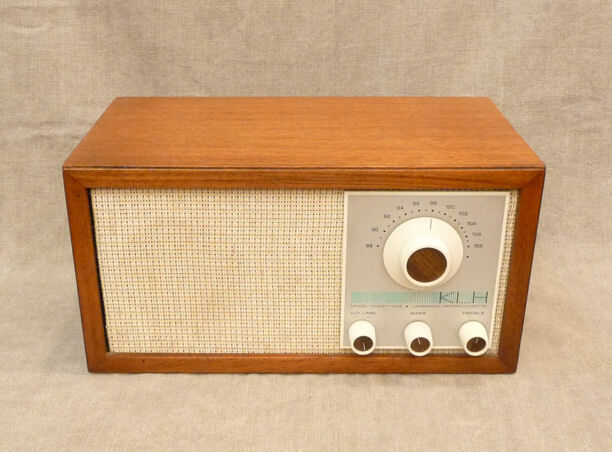 The KLH Model Twenty One (21) FM radio is legendary among collectors. 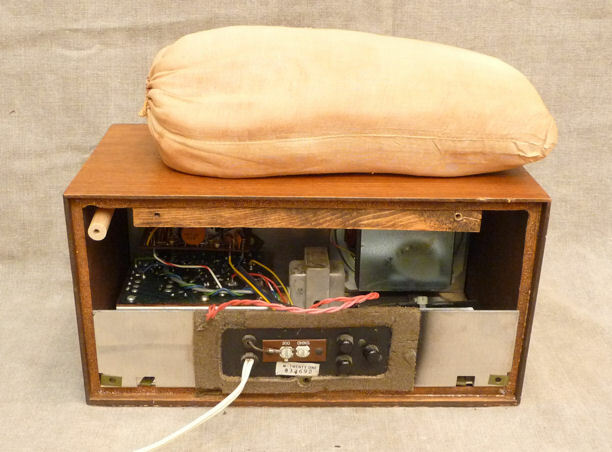 Designed by Henry Kloss, it creates wonderful sound for a small table radio. After reading about the Twenty One for years, I decided to find out what all the fuss is about. Here is my Twenty One after I finished work on it. 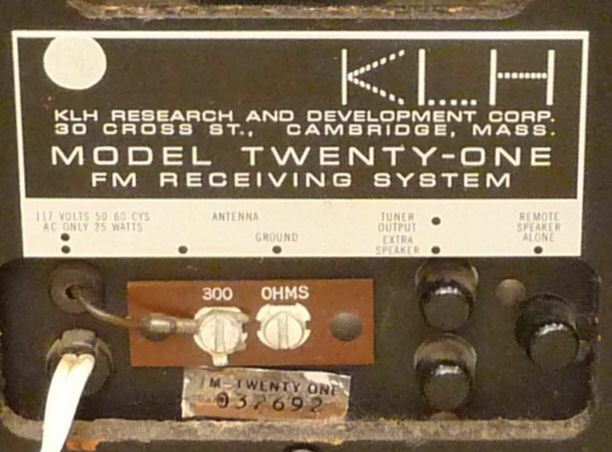 (By the way, KLH always spelled out their model numbers. 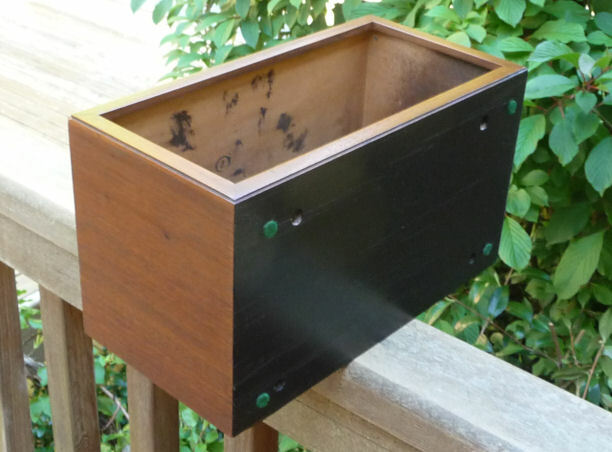 )The cabinet is walnut with a black fiberboard back. The knobs are cream colored plastic with brown plastic inserts in a grained pattern. The front controls are simplicity itself: tuning, power and volume, bass, and treble. A vernier mechanism provides precise tuning. The next photos show the radio before I spiffed up the cabinet. My Twenty One has serial number 037692. The connections are self-explanatory. Notice the three little plastic caps over the output terminals when they are not in use. This prevents air leakage through the terminals, preserving the integrity of the acoustic suspension system. Here, I have removed the back. Never having seen one of these before, I was a little surprised to find a pillow stuffed inside. It's another component of the acoustic system. Inside the pillowcase is fiberglass batting. 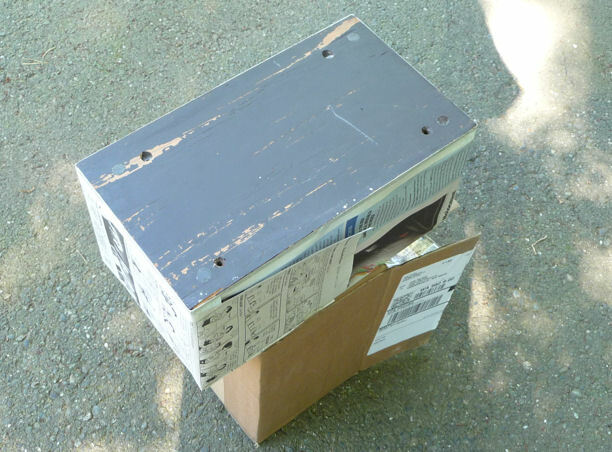 The first photo shows the back cover lying on top of the cabinet. The little black tub-shaped piece creates a recess when the back is on. It does no harm to unscrew the dowels, as I did with the left one, but they don't need to be removed to take off the back. 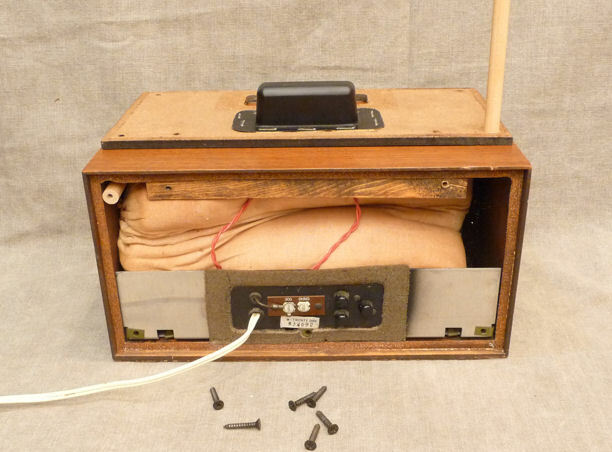 The acoustic suspension method uses a speaker tuned for a specific, sealed enclosure. We already saw the terminal caps. With the back off, we can see two more means of sealing the interior: a foam gasket around the terminal block and a narrow gasket that runs around the perimeter where the back fits into the cabinet body. The cabinet isn't as airtight as a spacecraft, of course. Tiny amounts of air can leak here and there, no doubt, but it's tight enough to accomplish the acoustic goal. 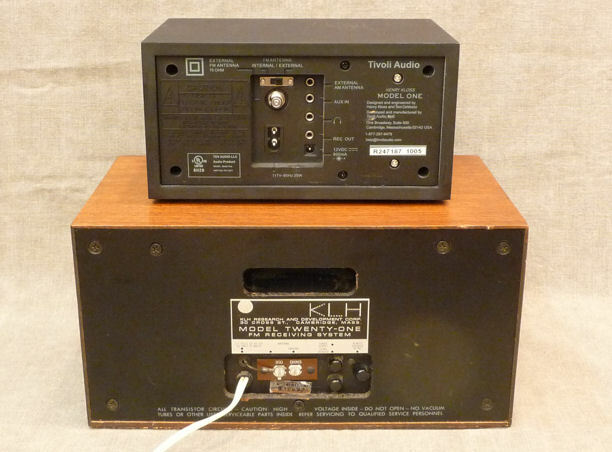 The Twenty One was Henry Kloss' last project before he left the KLH company. Its sire was the tube-based Model Eight, which is much harder to find. Both radios were available with an optional second speaker. 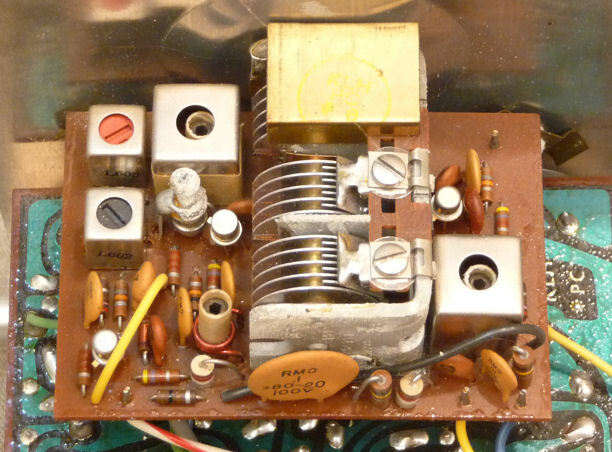 An even scarcer accessory was a stereo multiplexer for the Eight. My Twenty One is the original version with walnut cabinet and beige knobs and grille. In 1970, it was replaced by the Twenty One II with black knobs and grille, less desirable from a collecting standpoint. 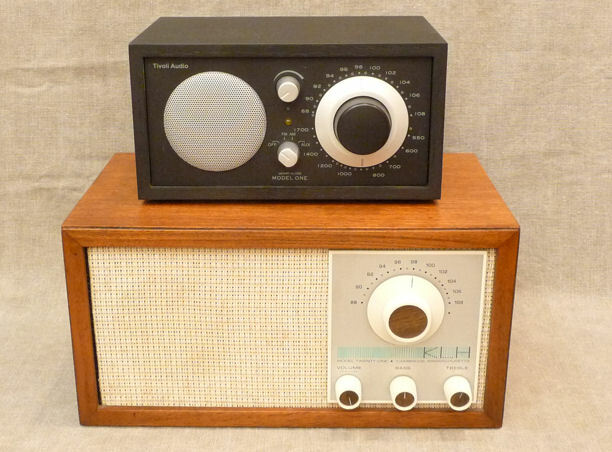 In the early 1970s, KLH was bought by the Singer company, which produced later models with vinyl covered cabinets, including a clock radio. These tacky-looking sets have little appeal to collectors, although they should perform acceptably. 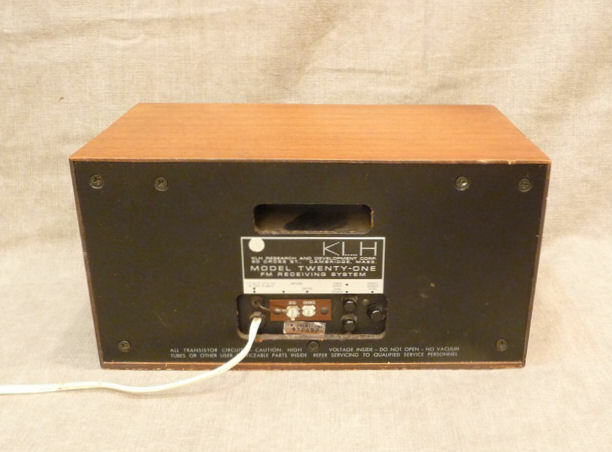 The KLH is a high quality set. It also is not easy to service. If yours works well, I'd leave it alone. If it needs repair, generic components such as capacitors and resistors can be obtained from many sources. For a proprietary part such as the tuner or various coils, the only source would be a junker chassis from another Twenty One. To take out the chassis, remove four screws from underneath and slide it backward out of the cabinet until its front touches the rear brace. Tilt the chassis slightly to clear the brace and then remove it all the way. There is no need to remove the knobs. These photos show the easily accessible chassis areas. 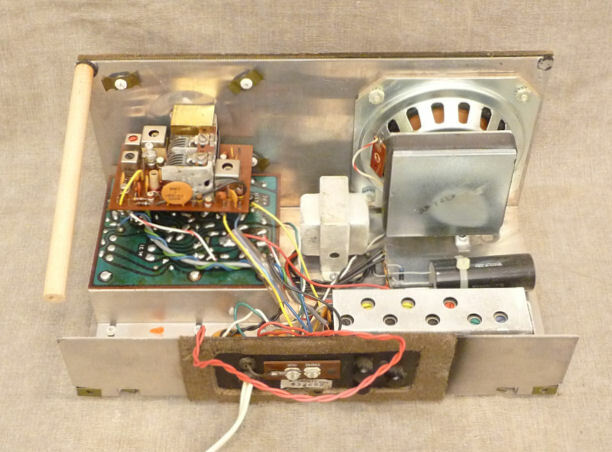 The Twenty One uses solid state components and AC power. On back of the speaker is a rubber-stamped date: June 22, nineteen-sixty-something. 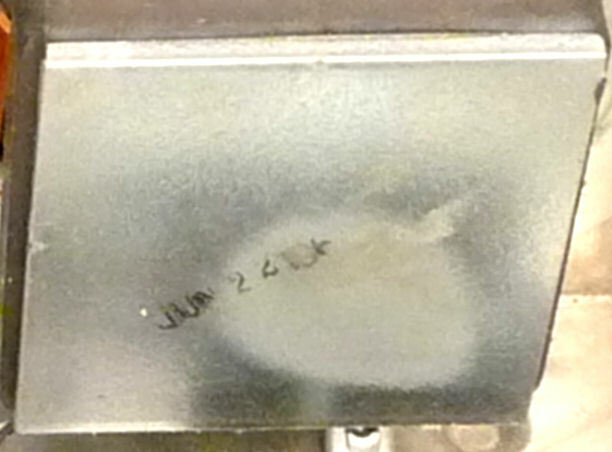 The last digit was rubbed off, so the exact year is unknown. We know the Model 21 was manufactured from 1965-1970, so I'll call mine a 1965 unless someone has a better idea based on its serial number. My radio had two small tuner issues. Moving the tuning knob produced loud static, which disappeared when you stopped tuning. The tuner also tended to stick slightly at certain points on the dial. Here's the culprit. As I suspected, the scratchiness came from oxidization of contacts in the air variable capacitor. I spritzed a tiny amount of DeOxit into them, then worked the tuner a few times and carefully removed the excess. Then I repeated the treatment with an electronic lubricant. This cured the problem completely. I also sparingly lubricated the tuner. Using a toothpick, I put a couple of drops of light, high grade oil into the ball bearing race for the tuner shaft. Then I worked the tuner back and forth several times. Setting the chassis on its back, I removed the vernier tuning knob and put a drop of oil at the junction where the inner (vernier) tuning shaft goes inside the main shaft. I worked the tuner a few more times, then left it to rest on its back overnight. The next day, I cleaned a tiny amount of excess oil from the vernier shaft and tried it out. Perfect! Enough oil had worked its way into the mechanism to free it up. In the previous photo, you may have noticed some fuzzy white stuff on the tuner frame and elsewhere. This transformer case is covered with it. The cabinet was in good shape, overall. The bottom paint was weathered, which was easy to remedy. I'm not to blame for the blotches and overspray seen inside the cabinet. They were done at the factory and I didn't see any reason to mess with them. The walnut finish had no damage to speak of, but it was dull, so I freshened it up. First, I lightly cleaned it with a soft cloth and denatured alcohol. You don't want to go crazy with this sort of alcohol, but it's great for removing old furniture wax and everyday grime. 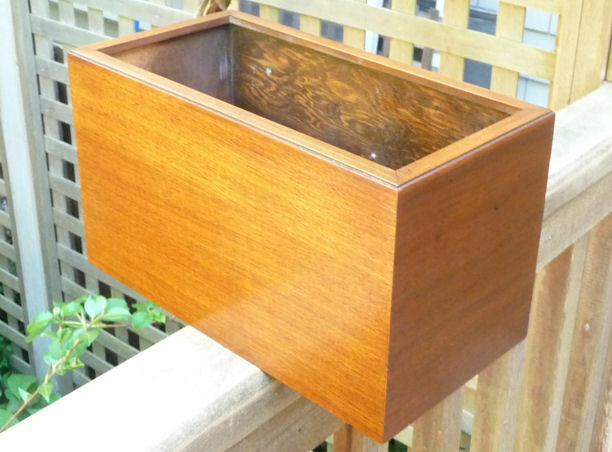 Then I gave it a light once-over with Howard's Restor-a-finish in the walnut color. Although I don't use Howard's for serious refinishing, it's quick and easy for this purpose. My knobs only required a little cleanup with Windex and a toothbrush. Exact replacements are not available. 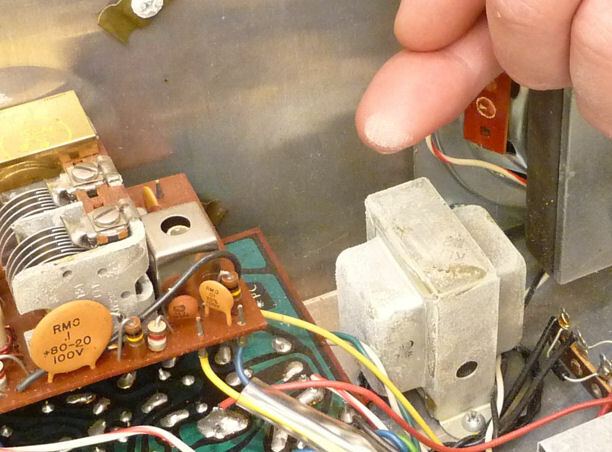 If your small knobs are missing or damaged, you'll have to look for something similar from another radio or a supplier who sells generic parts. The only replacement for missing tuner knobs would be to cast a reproduction using an original knob as the model. The Twenty One's "grille cloth" isn't cloth in the usual sense. It was designed for acoustical transparency and appears to be woven of PVC-like monofilament. There is no commercial source for an exact reproduction cover. If yours is damaged beyond repair, look for "monk's cloth" type fabric with approximately the same color and weave. My speaker covering had some little stains, which I cleaned with a soft children's toothbrush and a diluted solution of "Goof Off 2" household cleaner. I would never pull that kind of stunt with real cloth, but the plastic cleaned easily and didn't abrade. The covering is glued to the masonite face plate. Mine had loosened a bit in one corner and it got looser after I wet the front. If you want to remove a ruined cover, I'd try wetting it, possibly with gentle heat. Don't soak the masonite panel heavily, lest it swell and become deformed. It was easy to re-secure the covering. The old adhesive was still tacky, so after blotting up as much damp as I could, I squeezed that corner hard with my fingers and held it for a couple of minutes. That's it! After a couple of hours' work, I have a radio that looks and plays beautifully. 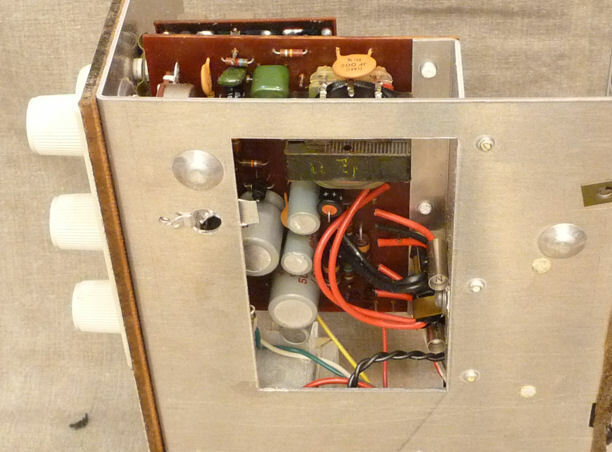 Kloss's final project was the Tivoli Model One FM/AM radio. The Model One has no interest from a collecting standpoint, but I got one as a premium for donating money to a public radio station. Here, my Model One and Twenty One are having a Kloss radio party. Designed decades later, the Model One carries forward the ideas behind Models Eight and Twenty One: high performance in a small package, with an understated, almost Spartan exterior. Besides adding AM, the Tivoli has a few more input/output options, and it optionally can use 12-volt DC power. Still, the family resemblance is unmistakable. With my son, Isaac, I conducted a blind "Pepsi challenge," playing both radios side by side and tuned to the same station, alternating between the two every couple of minutes. After several cycles, we traded places, so each could listen and compare. There wasn't a clear winner. Each radio sounds excellent in its way, yet they are distinct for reasons we couldn't easily quantify. Forced to choose, I'd pick the Twenty One. Perhaps the bigger cabinet gives it an advantage, or perhaps it's just me. These matters always boil down to personal preference, don't they? How About a Model Eight? A couple of years after buying this radio, I ran across a Model Eight, in original condition and reasonably priced. You can read about it by clicking the image below. It's hard to choose between these two, so the Twenty One currently resides in our kitchen and the Eight is in my office.